Nepenthes khasiana X truncata is a hybrid between a highlander and a lowlander. The cold tolerance comes from the N. khasiana crossed with the lowland N. truncata that adds the coloration and size. I purchased this hybrid from the Lelani Hapu'u Nursery as a rooted cutting on Ebay. They sell many of their cuttings as auctions on Ebay. The cutting was very "thick" so the parent plant must have some size to it. 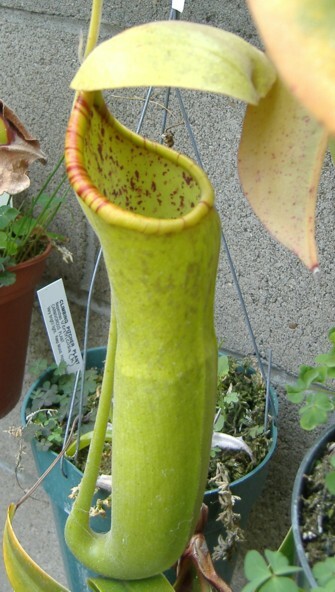 This hybrid produces some of the biggest pitchers in my collection. Even the leaves are very large too. It is a moderate grower that I grow outdoors in full sun. I've had no complications with this hybrid acclimatizing it to my lower humidity outdoors. It does seem to take a while for a pitcher develop but the pitchers are very large at this time. I mainly purchased this specimen because I like hybrids involving N. khasiana. Hybrids tend to be very tolerant of lower outdoor temperatures especially when crossed with lowlanders. One of my favorite hybrids is N. X mastersiana involving N. khasiana and N. sanguinea. Because of the N. truncata in it, this hybrid should be able to grow as an intermediate easily and possibly as a lowlander.